One of the greatest challenges with humanitarian projects is the initial sense that there is no defined project. This is what Daniel Ervin, RedR‘s assignee to UNICEF (formerly known as the United Nations International Children’s Emergency Fund), discovered when he arrived in Sri Lanka in the aftermath of the civil war between the Sri Lankan government and the Liberation Tigers of Tamil Eelam. Ervin’s role as emergency water supply and sanitation officer formed part of the Water Sanitation and Hygiene (WASH) program for internally displaced Sri Lankans. UNICEF led a cluster of organisations for this task. Despite sporting a range of qualifications and experience—from degrees in mathematics and geology to legal education and engineering work—Ervin admits that nothing in his past quite prepared him for the sanitation infrastructure project, servicing 300,000 displaced people. “I did a water supply project in Ethiopia that was a lot better defined as development work. In Ethiopia, there was only one actor and that was us, the state didn’t even have a role. In Sri Lanka, it was less defined because there were 150 other agencies doing things,” he explains. Much of the WASH program contained a hybrid of physical outputs with humanitarian outcomes and this is what the team had to keep in mind in its approach. While the standard measurement of success in projects like this is to provide a minimum of 15 litres of potable water per person per day, Ervin says this wasn’t the overall purpose. “If I’m part of a team that delivers water to a camp and they don’t drink that water because they might not trust it, then the supply is for nothing,” he notes, underlining that the true objective was to understand and meet water needs at the community’s level. Other factors, such as hygiene, came into play. “The supply of clean water saves lives, but only in a particular context. If you’re supplying clean water but hygiene and sanitation is poor, the rates of diarrhoea and disease won’t go down. So what’s important is to work within the social context,” explains Ervin. He notes that having Tamil women in senior positions in the office, and employing engineers who had a strong connection to the community allowed them to find culturally appropriate solutions and helped them promote sanitary practices. One cultural difference that UNICEF had to consider was the type of toilet to install. “In Sri Lanka, because it’s a wet country, people wash themselves, wash their hands and sometimes wash their feet; that’s a cultural factor we had to accommodate. 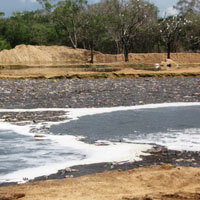 It just meant we had to deal with more wastewater than we could actually cope with,” says Ervin. Hygiene promotion thus involved both encouraging sanitary practices and reducing water use, “letting people know they had to be mindful that this water needed to be collected and we were having trouble doing that”.